After three conferences in Bamberg [Germany] (2013), Mardin [southeastern Turkey, in Turkish Kurdistan] (2014) and Amsterdam [Netherlands] (2016), we are delighted to announce that the 4th International Conference on Kurdish Linguistics (ICKL-4) will take place at the University of Rouen (Université de Rouen) [France] on September 2-3, 2019. Three meetings in the Kurdish diaspora, in the countries in Europe with the largest populations of displaced Kurds, plus one within Kurdistan itself. I haven’t worked on Kurdish myself, and I’m not close to its cultural milieu, but I did note that, despite the well-known antipathy (to put it gently) of the Turkish government to the Kurds, the organizers managed to pull off one ICKL within Turkey itself, in one of the 17 Kurdish-majority provinces. 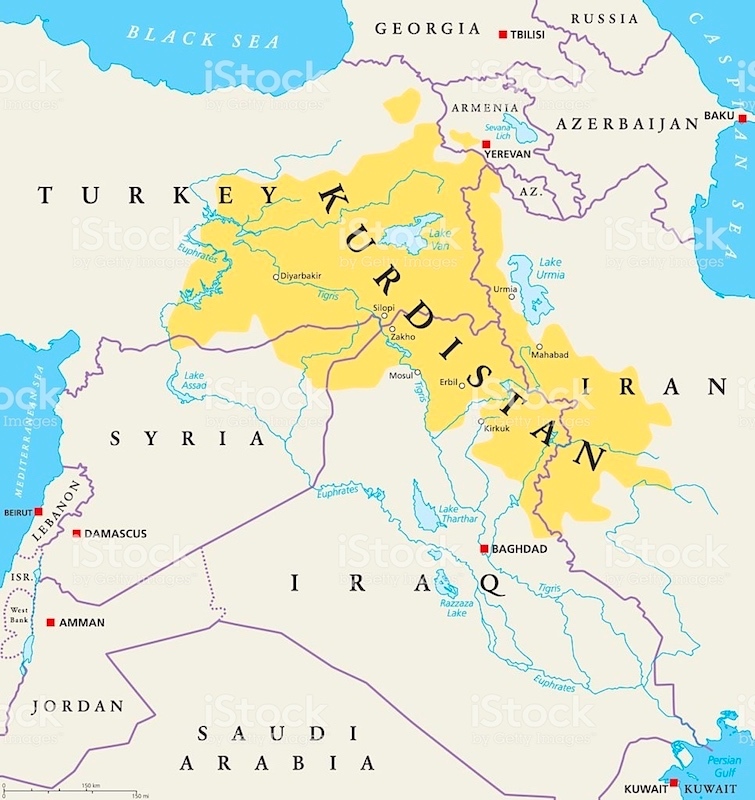 Then there’s Kurdistan, a region with no national status that could serve as an textbook object lesson in distinctions between ethnicity, religion, language, and nationality. The Kurdish language. An Indo-European language, ultimately related to familiar European language families like Germanic, Romance, Celtic, Baltic, and Slavic, and to Greek, Albanian, and Armenian. — Northwestern, of which [Kurdish is the dominant member]. — Northeastern, by far the smallest branch, of which Ossetian [in Ossetia, on the northern slopes of the Caucasus Mountains] is the dominant member. The Indo-Iranian languages, Indo-Iranic languages, or Aryan languages constitute the largest and southeasternmost extant branch of the Indo-European language family. It has more than 1.5 billion speakers, stretching from Europe (Romani), Turkey (Kurdish and Zaza–Gorani) and the Caucasus (Ossetian) eastward to Xinjiang (Sarikoli) and Assam (Assamese), and south to Sri Lanka (Sinhalese) and the Maldives (Maldivian). Furthermore, there are large communities of Indo-Iranian speakers in northwestern Europe (the United Kingdom), North America and Australia. The Indo-Aryan or [my preference] Indic languages are a major language family of the Indian subcontinent. They constitute a branch of the Indo-Iranian languages, itself a branch of the Indo-European language family. In the early 21st century, [Indic] languages were spoken by more than 800 million people, primarily in India, Bangladesh, Nepal, Pakistan, and Sri Lanka. Moreover, there are large immigrant and/or expatriate [Indic] speaking communities in northwestern Europe, Western Asia, North America and Australia. There are about 219 known [Indic] languages. So the ICKL conferences have tracked the largest Kurdish communities in Europe (Germany in 2013, Netherlands in 2016, France in 2019). The Kurdish region spreads over significant territory in four main countries (Turkey, Syria, Iraq, Iran), plus a small patch in Armenia (and some pockets in Georgia, not on this map). Turkey, Syria, and Iraq are predominantly Sunni Muslim — as are the Kurds — while Iran is predominantly Shia Muslim and most Armenians are Christian. Meanwhile, there are strong Kurdish-Persian ethnic and linguistic affinities. Kurds and Persians are generally of Iranic ethnicity, in contrast to the predominantly Turkic peoples of Turkey and the predominantly Arab peoples of Syria and Iraq. Linguistically, Kurdish and Persian are both Iranian languages (see above), entirely unrelated to the Turkish of Turkey (a language with disputed wider relationships, possibly including Mongolian and the Finno-Ugric family of Europe, to which Finnish, Estonian, and Hungarian belong) or to the Arabic of Syria and Iraq (and a swath of countries from Morocco through the Arabian peninsula and the Horn of Africa), which is a Semitic language (a family to which Amharic, Tigrinya, Hebrew, Tigre, Aramaic, and Maltese also belong). It’s a standard textbook lesson that ethnicity, religion, language, and nationality are in principle independent of each other, and the case of the Kurdish region is a nice illustration of the way in which the four factors can be decoupled. Personal note. This posting is, for me, unusually didactic in tone and straightforward in organization, without my customary personal reflections and digressions into unexpected topics having to do with cartoons, movies, music, gender, sexuality, language play, mistakes, plants, animals, and all that good stuff. This doesn’t happen often, so maybe you should savor it for its quaintness. Not that there isn’t a personal dimension here. I have a deep sympathy for beleagured minorities, especially those striving to maintain community in the face of threats from dominant groups: among others, blacks in the US and the UK, indigenous peoples all over the place, Jews outside of Israel, Muslims many places, Christians in Muslim areas, Uighurs, the Rohingya, Shias in Sunni lands, Armenians in the Ottoman Empire, Arabs and Jews in fanatically Catholic lands, nonbelievers in evangelical Xtian communities, and, yes, the Kurds. From early childhood, when I came to appreciate that I was profoundly different from most other people and the object of grave hostility for that, but somehow had to try to fashion a decent life for myself, I appreciated the parallels between the fix I was in and the situations of these beleagured minorities. The revelations of the Holocaust when I was a child were of course horrific on any grounds, but I saw them as a hard lesson: this is something people could, and would, do to those they viewed as different, unacceptable, irredeemably other. So I did what most German Jews did: I assimilated, hid my secret life as one of the Others, forged alliances with the powerful, learned their ways as best I could, but also searched out others of my kind. Yes, it was stressful, and ultimately it didn’t last — I found common cause with other misfits, rebelled, and (having achieved a certain amount of power of my own) flaunted my unacceptable self flagrantly. If they’re going to come for you anyway, why not play the game your way? (A sad lesson from “passing” — as I do, inadvertently, in many social contexts, where I’m taken to be straight, just because that’s the expected state — is that you get to hear what people say about your kind when they think it’s behind your back. This could easily make a queer think that almost all straight people would happily send you to a concentration camp. It certainly makes you very cautious about trusting straight people enough to accept them as friends. And no, I don’t expect my sympathy for beleagured minorities to be matched by their sympathy for my beleagured minority. I believe that a fair number of Kurdish men would prefer killing a gay son (or having him killed) over allowing that son to dishonor their family by being openly gay; that’s utterly appalling, and I would like to have that changed. In the meantime, I expect no quid pro quo; I just know what my moral universe requires of me, and that’s that I do what little I can for the fair treatment of the Kurds, even if it’s just writing about them and their situation sympathetically, as here. This entry was posted on February 12, 2019 at 3:10 pm and is filed under Kurdish, Language families, My life. You can follow any responses to this entry through the RSS 2.0 feed. You can leave a response, or trackback from your own site.